Our starting point is a normal lateral radiograph of the cervical spine. 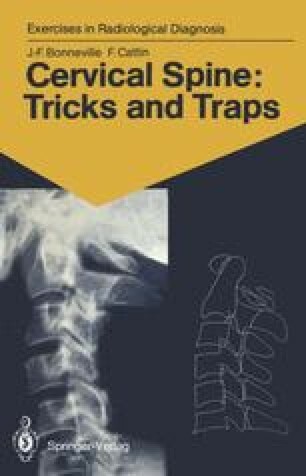 It will serve as a guide and point of reference in our task of comprehending the interrelationships between the structures of the cervical spine. This radiograph correctly includes the entire area from the base of the skull to the cervicothoracic junction. The soft tissues are clearly visible anteriorly, as are the extremities of the spinous processes posteriorly. In this case, with the subject looking straight ahead, is a slight, regular, physiological lordosis of the cervical column.